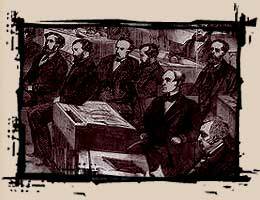 A session of the Senate in 1868, with the Senators seated at their desks within the chamber. Jim Crow was a system of segregation and discrimination practiced in Southern and some border states soon after the Civil War. The exact origin of the name is not known, though it is likely to come from a minstrel of the early 1800s. Of the three branches of the federal government, the legislative was most effective in enacting and maintaining discriminatory laws that kept Jim Crow alive well into the 1960s. The Compromise of 1877 decided the outcome of the controversial presidential election of 1876 through a series of back-room discussions between Congressmen and private interest groups, and resulted in the retreat of the federal government from enforcing the 14th and 15th amendments for blacks. The Congress had passed the Civil Rights Act in 1875, making it illegal to discriminate on the basis of race, but there was a national backlash against civil rights that led to the Supreme Court's nullification of the Civil Rights Act in 1883. North and south began a period of reconciliation, characterized by acquiescence on the part of Northern liberals and government officials to the desires of the white south to institutionalize its discriminatory and racist beliefs. Many Southern blacks had become politically active after the Civil War, but after 1877, most lost the right to vote or to hold government positions. In 1878, the Congress forbade the use of the Army to protect black voters from the intimidation and physical violence with which they were regularly threatened at the polls. By 1894, Congress ceased appropriations for federal marshals to protect black voters; meaning blacks were vulnerable to intimidation and threats of ex-confederates. In 1901, the last black representative lost his seat in Congress. It would be 30 years before a black person could gain a seat in the House or Senate. During the early part of the 20th century, the Presidents and the Congress worked together to decrease the number of federal appointments to blacks and to ensure that federal officials in the south were sympathetic to the cause of white supremacy. During the early years of the Wilson administration (1913-1917), the Democratic Representatives submitted more racist legislation than had been introduced to any previous Congress. Disfranchised and demoralized, few blacks voted during these years, leading to an even greater indifference of both parties to the black vote. The Republicans did not need black votes to control Congress, and Democrats did not care about a black constituency. When legislation was introduced to protect blacks, Democrats convinced Republicans to join them in their disregard for civil rights and suffrage for blacks. Congressman L.C. Dyer of St. Louis submitted an anti-lynching bill in 1922 that was shelved when Southern Democrats threatened a filibuster in the Senate. Southern Democrats regularly blocked the efforts of a few liberal Congressmen to pass protective legislation for blacks. Republicans continually gave in to the demands of the Southern Democrats, and President Harding (1921-1924) did nothing to interfere, nor did his successors, until the late 1930s. Through the 1930s, legislative dominance by Southern Democrats was buoyed by strong party allegiance in the south and a weak Northern Democratic party. Legislators were more concerned with passing relief bills for an economically depressed constituency than with helping blacks regain suffrage in the South. Black leaders referred to the New Deal as the "Raw Deal," as blacks' concerns were largely ignored. Roosevelt needed the votes of Southern Democrats to pass relief legislation, and he feared losing Congressional support by introducing any provisions for civil rights. The D.C. Anti-Lynching Committtee North Eastern Federation of Colored Women's Clubs issued a list of the congressmen who voted against the Dyer Anti-Lynching Bill in 1922. See who was on it.